How to glue dissimilar materials? The answer lies within! One challenge in fabrication is getting two objects to stick to each-other with a bond that is not going to fail when you least expect it. Picking the right glue for the right job can be a real challenge. Some materials either react poorly to certain glues and solvents, or just refuse to bond. 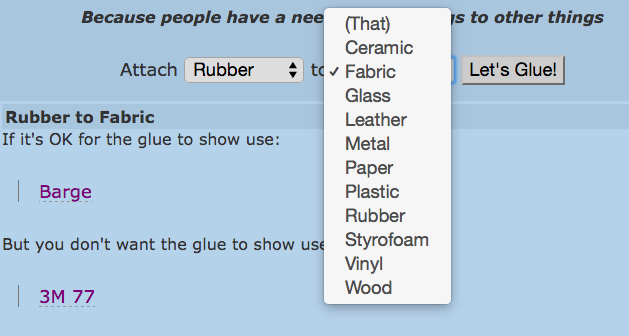 You pick the two materials you wish to glue [Rubber] to [Fabric] and it tells you that you want to use Barge or 3M 77 spray if you don't want the glue to show. Each adhesive it suggests has a link to a page that details its various properties like toxicity, time to adhere, where to find it, and other similar adhesives. And it's always a great idea to test a new adhesive on scrap material before applying it to your project!